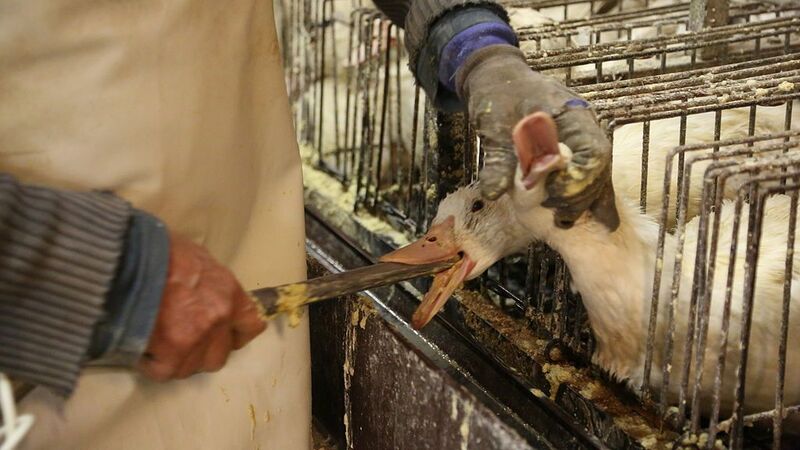 USA: Petition: Ban Disgustingly Cruel Foie Gras in New York City. For a foie gras duck or goose, the suffering is endless. Every day, up to four pounds of grain and fat are pumped into the stomachs of these helpless birds, until their livers swell to ten times their normal size — all to make a cruel French “delicacy” from these bloated organs. These innocent victims are force-fed with feeding tubes stuck down their throats, and often have trouble just standing due to their unnaturally enlarged livers. Kept in tiny, cramped cages, they are unable to clean themselves and become covered in their own excrement. However, in one city there is hope for these brutalized animals. New York City Councilwoman Carlina Rivera has introduced a long-overdue bill that would impose a citywide ban on the sale of foie gras by vendors and restaurants. The barbaric practices used for foie gras are inexcusable. It is imperative for New York City to stand up against animal cruelty by passing this bill. Sign this petition urging New York City Mayor Bill De Blasio to support the ban on foie gras in New York, and work hard to ensure that it passes.